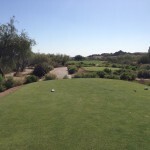 I recently got the chance to play 18 holes at Troon North Golf Club in Scottsdale, Arizona. 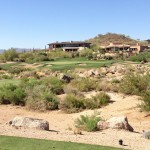 They have two courses at Troon North including the Monument Course and the Pinnacle Course. 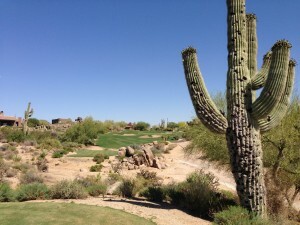 Both courses are unique, but challenging offering some of ten best views in the Valley. 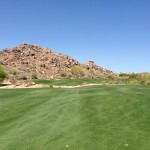 I had the pleasure of playing the Pinnacle Course. 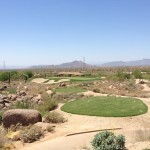 Troon North is the Flagship of Troon Golf-leaser in upscale golf course Management is over 23 countries around the world. 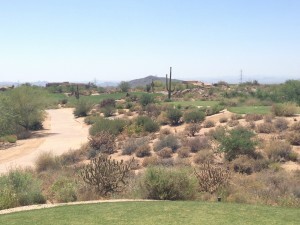 One of the best amenities at Troon North is their practice facility. Unlimited use of the practice facility is included with greens fees, including the driving range, chipping green and putting green. If you hurry, you will find a big cup on the practice green. They have been hosting big cup events lately, and they left a big cup on the practice chipping green so you can see what all the fuss if about. Before you tee off, make sure you take some time to roll some putts. 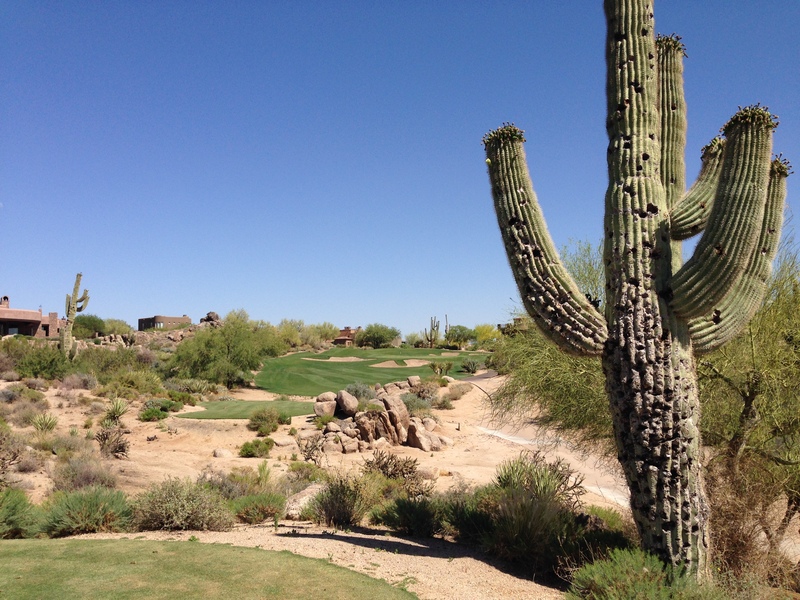 The greens at Troon North are quick, so you want to make sure you have a handle on the speed. 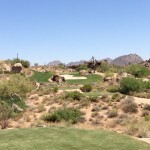 While you are putting, make sure to listen for the waterfall right behind the first tee on Pinnacle. Close your eyes and get lost in the serenity offered at Troon North. Let’s play some golf. Fore! The first tee box is right by the clubhouse, and provides an intimidating tee shot. 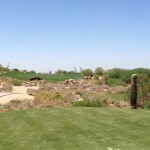 The hole isn’t that long, depending on what tees you play, but could lead to a rough start if you miss the fairway. 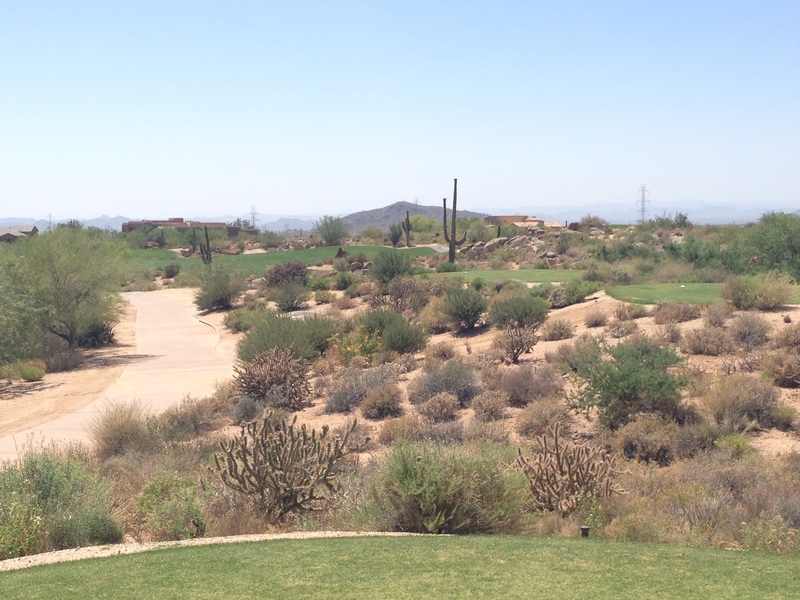 They have five sets of tees at Troon North. We played the Gold tees. Off the tee, a driver is a risky decision. But if you miss, miss left because there are bunkers right that will gobble up your ball. The setting behind the green is pretty spectacular, so try not to get lost in the scenery. This hole is shorter than hole #1, but again, it’s hard not to hit a driver. The green is also hidden from the tee box, but the landing area is generous. 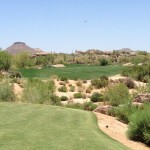 If you find the fairway off the tee, you will have a short iron into the green. Depending on where the pin is, like most holes, just aim for the center of the green. The views from the green to the next tee box are simply breathtaking, so take it all in. The views alone make this course worth playing. On this tee shot, make sure you find the fairway. 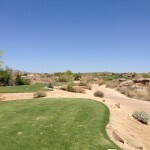 The hole is long, and while downhill, will still require a good distance off the tee to have a chance at birdie. There really isn’t anywhere to miss, so aim straight and hope for a member’s bounce if you spray it off the tee. On hole 4, there is a nice home behind the green. 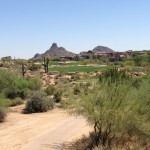 A good aiming point off the tee is a giant saguaro to the left side of the house. There are somewhat hidden bunkers on the right, but plenty of room to miss if you happen miss left. Depending on the wind, this can be a long hole. It is 399 yards from the Gold tees. The width of the fairway let’s you “grip it and rip it” a little bit. This is the first par 5 on the front side, and if you really crush a drive, it’s possible to reach in two strokes. Don’t go long here, though. There is nothing but trouble over this green. 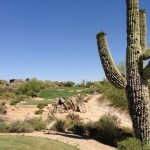 From the tee box you will see a saguaro that has been pelted with golf balls. Aim just left of that for the perfect position to reach this green in two. If you do lay up, you have a couple of options. There is a waste area about halfway there, but a second fairway right and long of that. Your second shot is definitely a risk/reward situation. 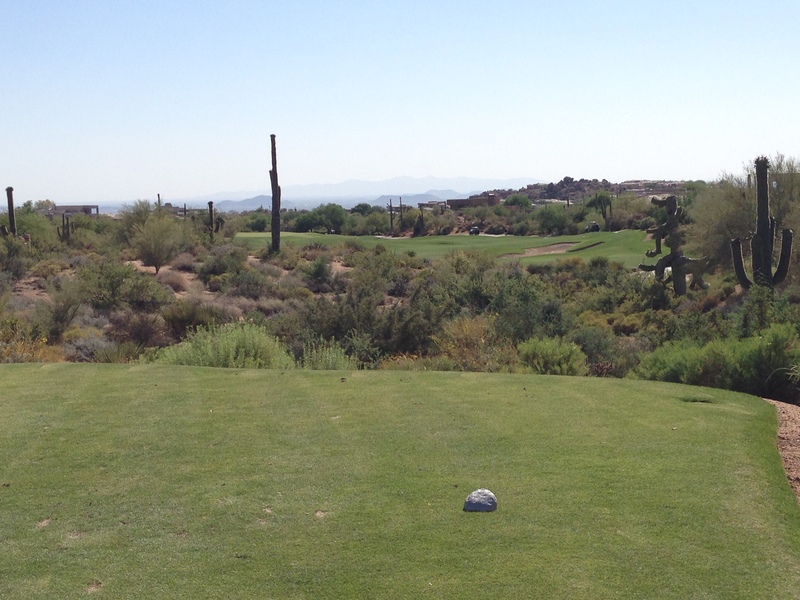 This is one of the most gorgeous tee shots on the golf course. Granted, I could say that about a lot of holes on this golf course. 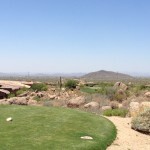 This is a short par 3, with nothing but nothing but mountains in the background. This hole is downhill, so take less club. The miss is right, as there is a huge bunker left. There are also several different tees to choose from that provide a different perspective. They can introduce some fun pin placements here, too. 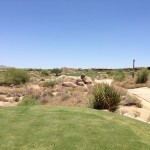 The fairway is wider than it looks from the tee box, but you still need to be strategic off the tee. 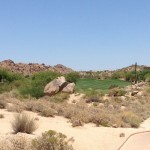 Don’t miss right, as the desert will gobble up any balls hit over there. If you miss right, though, the balls will tend to kick left. We call that a “member’s bounce” where I come from. The green on this hole is quite long, and starts way left of a greenside bunker. Depending on where the pin is, you could have a long putt for birdie if you hit this green in regulation. Another gorgeous tee shot. This green slopes back to front, so make sure you are on the same tier as the pin. The miss here is definitely left, as balls funnel right. If you do miss right, you won’t have a lot of green to work with. It’s a tough par from over there. It’s. This is a tough hole, considering the distance. 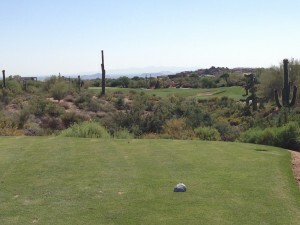 This is a short hole, so pick your club wisely off the tee. The green is also big, and allows for some creative pin placements. If you do hit driver, make sure you hit it straight. Not much room to miss left or right on this hole. Once you get to the green, look around. There are some amazing views from up here. The house on the left is simply stunning. I wouldn’t recommend hitting driver here. It’s only 268 yards to the bunkers from the Gold tees, and this isn’t a long hole. Hit a 3 wood and play this hole smart. If you do find yourself in the bunkers, don’t miss long. Not a lot of room behind this green. This is a long par 5, but if you cut off the fairway a little bit, you can give this green a go in two. For most golfers, just aim to the center of the fairway. Your second shot will have you laying up short of a waste area. Unless you are confident, just play it safe. The tee shot here is pretty wide open. It’s a short hole, but you need to plan for your second shot, as this green is surrounded by bunkers. There is a large mound on the left side of the fairway. 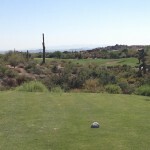 Aim toward that and your ball will filter right back toward the middle. This is a short par 3 aptly named saguaro. 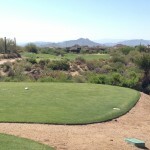 There are saguaros surrounding this hole. The one to the right of the tee box has been hit a few times by errant tee shots. The green on this hole is small, and is surrounded by bunkers. 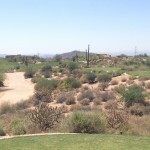 Take aim for the large saguaro just behind the green to find the center of the putting surface. Make sure you take enough club, as the large bunker in the middle short will collect any missed placed tee shots. This tee shot is incredible. Look left and you will see Tom’s Thumb in the distance. If there is a hole on the back you can grip it and tip, it’s here. 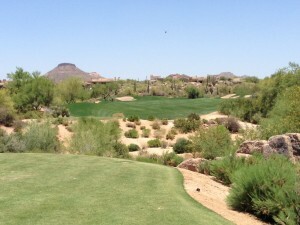 Hole 14 is a long but manageable par 5, but it’s the tee shot that entertains out here. From the back tees, make sure you pack a lunch. This is another grip it and rip it opportunity. 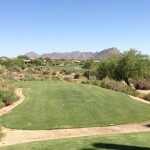 The landing area is wide, and if you really catch one, you will have a short iron or a wedge into the green. The views up here are pretty stunning, too. 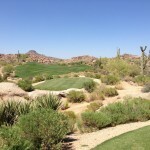 I like Monument… But I am starting to like Pinnacle more! This might be my favorite hole on the course. 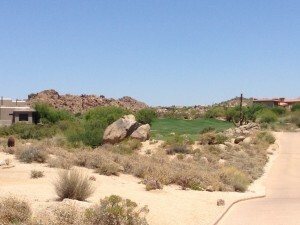 It’s the shortest par 3 on the golf course, but might be the most intimidating. There are some nice homes directly behind the green, too. Depending on where the pin is, you can use the back of the green to help you. Just take it all in here, because this hole is just gorgeous. This is another chance to let the big dog eat. It’s a long hole, too, so you need some distance off the tee to make this hole approachable. If you miss, miss left. The fairway will kick most shots back toward the middle. 18 is a great finishing hole. The practice green is actually connected to the green here, and you get a gorgeous view of the clubhouse from the fairway. The hole is a slight dogleg left, so make sure you miss right.